After the invasion of Russia in the summer of 1941, the Germans found themselves at a disadvantage with regards to anti-tank capability. The T-34’s and KV-1’s were an unexpected challenge that the available anti-tank weapons, like the 4.7 cm Pak mounted on the Pz.Kpfw.I chassis, were not able to handle. Temporary solutions mounting larger guns began to be developed. These were mostly 7.5 cm guns mounted on the Pz.Kpfw.II and the Pz.Kpfw.38 chassis. In the summer of 1942 the Germans began the development of one of these temporary solutions but with a larger caliber gun. It would include the development of a new 8,8 cm anti-tank gun based around the 8,8 cm Flak as well as a self-propelled chassis to mount it on. 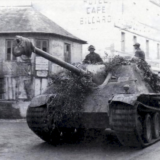 The chassis would end up being a hybrid of the Pz.Kpwf.III and PzKpfw.IV and was designated the Panzerjäger Hornisse (Fahrgestell Pz.Kpfw.III/IV). This would be basically the same chassis that was used for the Hummel. The gun would be designated the 8.8 cm Panzerjägerkannonen 43/1 (L/71). While the gun made it a formidable weapon, the Hornisse had some distinct disadvantages. The superstructure was large, had no overhead cover, and was thinly armored. This made it an easy target to spot and destroy. It also provided only marginal protection for the crew even from lower caliber weapons. The gun had very limited travel from side to side which made it very vulnerable in close range combat. The ideal use of this weapon would be to engage the enemy at a long range from a highly concealed position. Production of the Hornisse began in 1943 at Alkett. Ater a few months of ramp up, the production rate was expected to reach 40 Hornisse per month. Later Deutsche Eisenwerke A.G. in Duisburg would take over production of the Hornisse after Alkett had been hit by a bombing raid in November, 1943. The program called for 500 Hornisse to be produced, and by the wars end, 494 Hornisse had been completed. 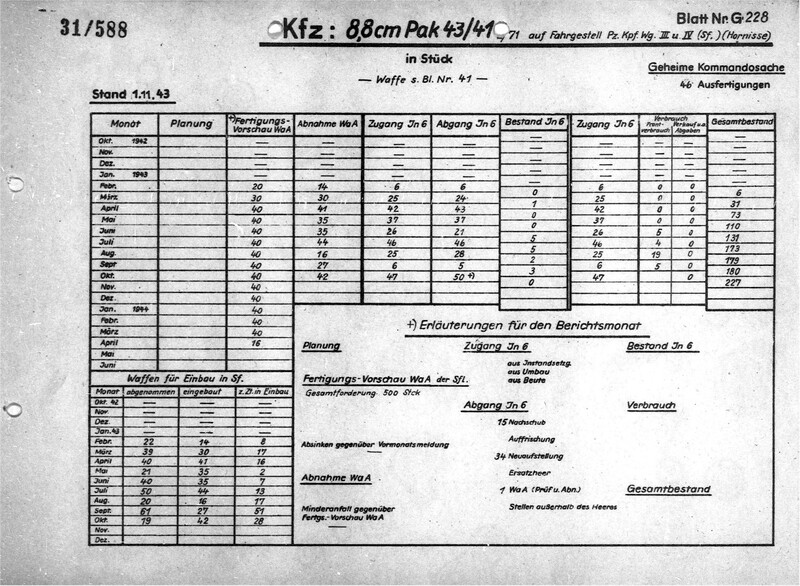 Below you can see a production chart as of November 1st, 1943. The plan was for deliveries to begin in May of 1943 with 100 vehicles being delivered that month. They did not make that goal, but s.H.Pz.Jg.Abt.560, s.H.Pz.Jg.Abt.655 and s.H.Pz.Jg.Abt.525 would each receive vehicles in May. Hornisse would be renamed Nashorn in 1944. The Hornisse were not organic to the panzer division but were organized as independent Panzerjäger Battalions. This would be the theme for many of the Panzerjäger and Jagdpanzer vehicles produced. These battalions would then be assigned to an Army or Corps that would then assign them to support specific divisions or units. 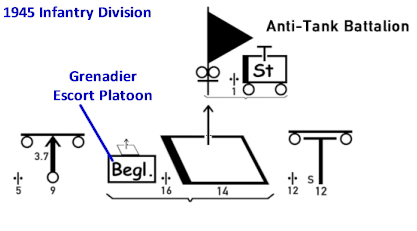 Often the companies would be pieced out to different units to spread out the anti-tank support. 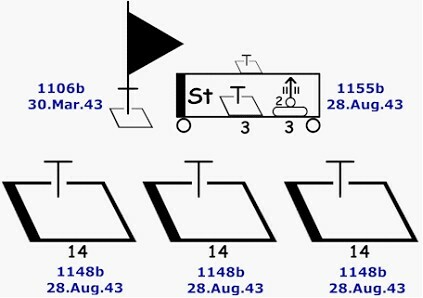 The organization was typical of an independent armored battalion and consisted of 45 Hornisse and around 766 men. The Hornisse units would be organized under a new KStN created specifically for the Hornisse. 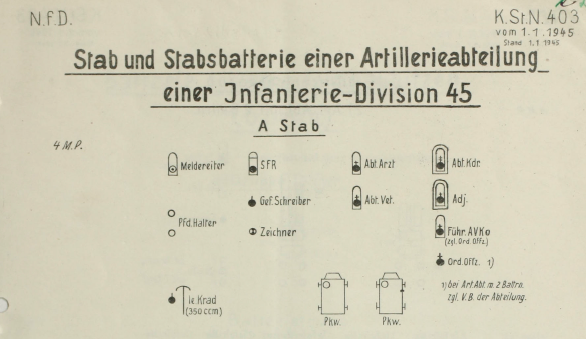 The Stab (HQ’s) unit would be 1106b and dated 30.Mar.1943. The Stabskompanie (HQ’s Company) was 1155b and dated 1.May.1943. And the Panzerjägerkompanie using 1148b dated 1.Apr.1943. 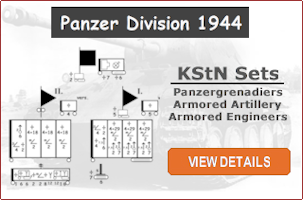 Both the Stabskompanie and the Panzerjägerkompanie had earlier provisional versions of their KStN. 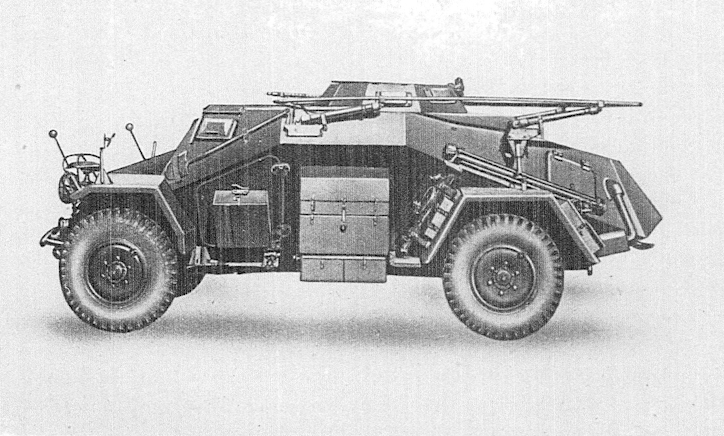 The Stabskompanie would have three Hornisse (Sd.Kfz.164) authorized, three Sd.Kfz.7/1 in the Fliegerabwehrzug (anti-aircraft platoon) as well as an Sd.Kfz.251/8 (ambulance half-track). Each of the three Panzerjäger Companies would have 14 Hornisse, giving the battalion a total of 45. New K.St.N. 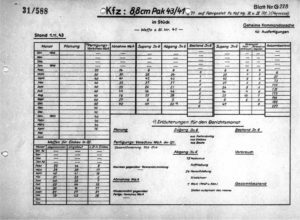 were introduced on November 1st, 1943 for the battalion HQ’s company and the Panzerjäger company. However, there was actually very little change in the K.St.N. Two companies of Nashorn did operate in the West in late 1944 as part of II./ Pz.Reg.2 but this was no more than 22 vehicles. KStN Diagrams for an artillery regiment of a 1945 infantry division.